Two of my favorite things: hockey and donuts. 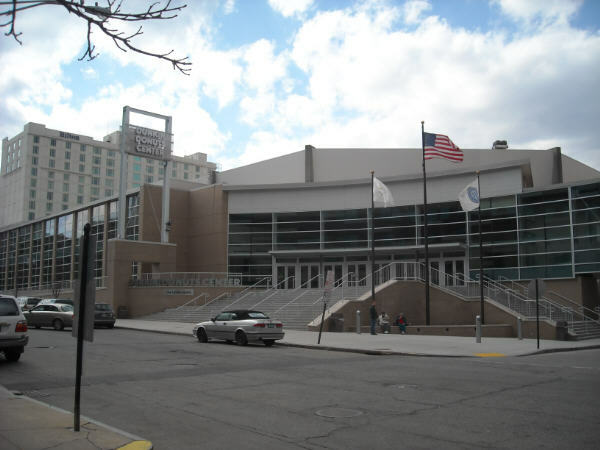 The Dunkin' Donuts Center, aka the Providence Civic Center, opened in 1972, although recent renovations within the last 5 years make the place seem more modern than that. The building is set in downtown Providence, right next to the attached Convention Center. The newer brick and glass facade blends in well with the neighborhood, but a walk around the backside of the arena makes it immediately evident that this is a 1970's era arena, as the mainly concrete exterior is more evident there. I did take note that the parking options were all quite expensive as I ended up in the $10 parking garage about a block away. Other garages were going for 15 bucks, although I am sure regular attendees are able to score more affordable parking options with their knowledge of the area. Entering the lobby and box office the building seems impressive, with a large lobby and quite a few box office windows. There is an enclosed pedestrian ramp to the Convention Center next door, which dumps you out right in the lobby. A large metal overhead sign in front of the turnstile entrance confirms you are at the Dunkin' Donuts Center in case you forgot. Once you enter you are on the concourse, which extends 360 degrees around the building. There are quite a few food and merchandise vendors, and a decent team store as well. The concourse is fairly wide, although it gets very crowded as this is the only concourse in the building, and leads to the upper and lower levels. In trying to keep with the Bruins theme many of the accent walls in the arena are a bright (almost too bright) yellow. An upper level ticket for today's game against rival Hartford was $18. Once inside the seating bowl you can tell this is a big arena, reminding me somewhat of a more symmetrical Rochester War Memorial. The blue seats extend all the way around the rink, and extend quite high up. The sight lines are good despite this being a big arena, as the 11,000 capacity is bigger than a lot of AHL arenas. There are luxury suites along the top, accessible from a separate stairway, and they extend 3/4 of the way around the building. The concourse runs about half way up the seating area, and as you enter the seating bowl you either go up or down to get to your seat. Perhaps the most noticeable, and somewhat out of place, thing that you see is the HUGE video scoreboard over center ice. The picture quality on the screens is amazing, but it is simply too big for the building in which it sits. Picture if you will a schoolbus parked in a 2 car garage and you get the idea of how the scoreboard just does not fit with the rest of the building. To compound matters the numbers giving the score and shots on goal are even giant. I guess the good thing is that is is friendly to the visually impaired. One other quirky thing about the arena is the fact that the upper level and lower level section numbers do not correspond. For example section 115 is below section 221. I realize that due to the upper and lower level sections being different in size it is difficult to have the section numbers correspond perfectly, especially when they share the same entrance, but other arenas manage to do it and the set up in Providence is a little confusing. The game presentation itself is good, although there are the usual minor league sponsor plugs and ads. The views are good and the annoyance of the overly large scoreboard is easily forgotten once play starts. Even from high up in the corner you can see the action well. The P-Bruins fans are very enthusiastic and knowledgeable. Providence has what I consider the Golden Ticket, or in this case the black and gold ticket, of having the Bruins farm team. New England is so saturated with high level hockey, from Division 1 NCAA teams, (2 in Providence alone in fact) to an abundance of AHL teams nearby, that attendance at a lot of places is not what it should be for the level of play. The fact that New Englanders love the Bruins almost as much as the Red Sox surely helps Providence a ton, as they are in the top 10 in minor league attendance, but at the top of the crowded New England market. A good crowd of almost 8000 watched the Bruins beat Hartford 5-3. Although the place was quite a ways from sold out it was plenty loud. The crowd really gets into the game and this is a fun place to watch hockey. Despite the recent renovations the place has both an old time, and a big time feel to it. I had a blast at this game. 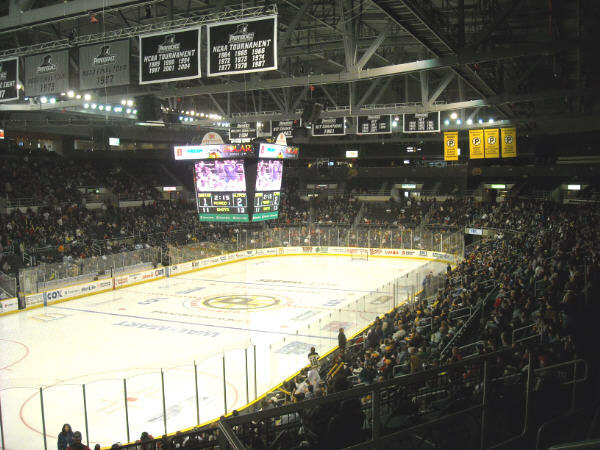 The AHL is alive and well in Providence, and that is a good thing. As for the donuts, yes they are available at an in house Dunkin' Donuts stand, and the line is as long as it is at most Dunkin' Donuts in the northeast (that would be long, just like at Tim Horton's if you are Canadian). I just couldn't fork over $2 for a single donut when there is a similar store on almost every corner and you can get the same donut for 85 cents. I guess Dunkin' Donuts is making back the millions they spent on the naming rights to the Civic Center- one donut at a time. 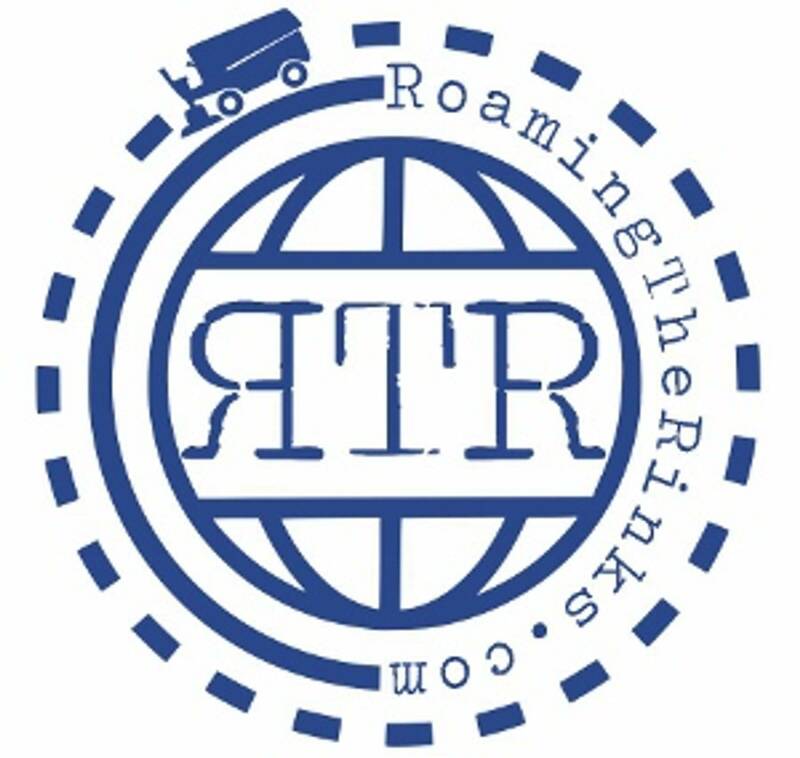 Check this place out if you can. The atmosphere is old time, but the building is updated enough to be comfortable for all. I would prefer watching a game here over an overpriced NHL game at the Garden any day of the week.